The perfect book for stressed-out adults who want to reconnect, simply and easily, with their inner creativity. Many of us experience fear every single day: job loss, loneliness, relationships, money, sickness, anxiety, and more. Fear has become infused in our culture, and it affects our day-to-day functioning and quality of life. A simple and inexpensive way to relieve stress is by coloring images, which can be soothing. Some even consider it an alternative to stressors, ultimately aiding in reversing the effects of anxiety. Refocusing your attention on something completely different to engage in a mental, physical, and emotional shift can help break the pattern of consistent stress and allow one to rejuvenate. 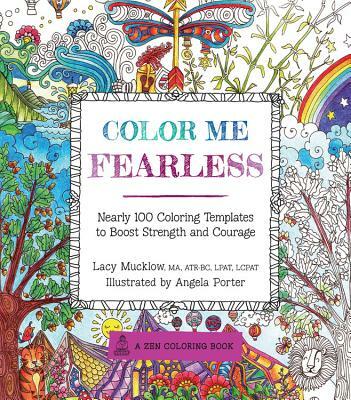 Part of the international bestselling Color Me series, Color Me Fearless is a guided coloring book for adults coping with their own daily fears. Art therapist Lacy Mucklow and artist Angela Porter offer up 100 coloring templates, all designed to boost strength, courage, and confidence. Organized into seven therapeutically themed chapters, readers can explore the benefits of putting pencil (or crayon!) to paper and channel their day-to-day stresses into a satisfying, creative environment. Color Me Fearless is the perfect way step back from the fears of everyday life, color, and relax! Don't forget to try Color Me Happy, Color Me Calm, and Color Me Stress-Free! Lacy Mucklow (MA. ATR-BC, LPAT, LCPAT) is a registered, board certified, and licensed art therapist who has been practicing art therapy in the Washington, DC area since 1999. She has experience working with a variety of mental health populations and settings, including schools, home-based counseling, and hospitals with adolescents, families, and adults. Lacy holds a Bachelor of Arts degree in Psychology with a minor in Studio Art from Oklahoma State University, and a Master of Arts degree in Art Therapy from The George Washington University. Angela Porter is a self-taught artist who finds inspiration in nature, especially ammonite and other fossils. Much of her work is abstract with flowing lines, shapes, and colors that create textured and detailed artworks. She works with technical drawing pens, watercolors, inks, colored pencils, and metallic paints and pens. She lives in South Wales.